Vance C. Dalton Jr., Carolina Farm Credit CEO, recently recognized employees for their years of service. Employees who reached five-year incremental service anniversaries in 2013 were recognized at a ceremony during the annual employee appreciation day held at Tanglewood Park in Clemmons, N.C.
We are thankful for all of our employees and are especially grateful for the dedicated years of service provided to agriculture and rural America, by those who have achieved these career milestones. “Being a service organization our people are our greatest asset,” said Dalton. “We are thankful for all of our employees and are especially grateful for the dedicated years of service provided to agriculture and rural America, by those who have achieved these career milestones.” Carolina Farm Credit has 232 employees throughout its 36 service centers and administrative offices. The average tenure of a Carolina Farm Credit employee is 14.4 years and currently 53% of employees have ten or more years of service, almost 30% of employees have 20 or more years of service, and over 9% have at least 30 years of service. 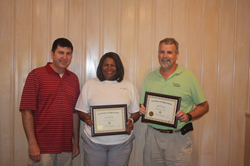 Those recognized for thirty five years of service: Inar Becton, Brown Summit; Kim Head, Statesville Administrative Office; and Dale Parker, Rural Hall. Those recognized for twenty five years of service: Cathy Chamberlain, Yadkinville; and Joyce Frye, Carthage. Those recognized for twenty years of service: Vance Dalton, Statesville Administrative Office; Steve Motsinger, Pilot Mountain. Those recognized for fifteen years of service: Kelly Adams, Statesville Administrative Office; Lucy Allen, Ellerbe; Janie Furr, Concord; Marjorie Marsh, Hendersonville; and Natalie Outlaw, Hendersonville. Those recognized for ten years of service: Mark Bray, Director; Rob Crain, Statesville Administrative Office; Laura Hamilton, Liberty; Michael Hamrick, Spindale; Roger Hinshaw, Liberty; Pam McGee, Pilot Mountain; Matt Mintmier, Asheboro; Dangela Pearson, Asheboro; and Shirley Price, Liberty. Those recognized for five years of service were: Travis Allen, Salisbury; Amanda Byrd, Yadkinville; Ryan Bledsoe, Yadkinville; Kyla Craven, Siler City; Roger Davidson, Statesville/Taylorsville; Beth Fox, Statesville Administrative Office; Matt Gutierrez, Murphy; Kerie Hildreth, Statesville Administrative Office; Michele Holt, Graham/Roxboro; Scottie Hughes, Lexington/Mocksville; Lisa Jones, Albemarle; Carol Tucker, Siler City; Allison Wike, Wilkesboro; and Mark Wilburn, Asheboro. Carolina Farm Credit serves over 9,000 members with loans outstanding totaling more than $1.4 billion. The association’s territory covers the western half of North Carolina, with branch offices located in Albemarle, Asheboro, Asheville, Boone, Browns Summit, Burnsville, Carthage, Concord, Conover, Ellerbe, Graham, Hendersonville, Hillsborough, Jefferson, Lenoir, Lexington, Lincolnton, Marshall, Mocksville, Monroe, Murphy, Pilot Mountain, Roxboro, Rural Hall, Salisbury, Shelby, Siler City, Sparta, Spindale, Statesville, Taylorsville, Wadesboro, Waynesville, Wilkesboro, Yadkinville, and Yanceyville. Directors for Carolina Farm Credit are Mark A. Bray, Chairman, Lawsonville; L. Kim Starnes, Vice-Chairman, Salisbury; John M. Barnard, Statesville; E. Bernard Beck, Seagrove; W. Rex Bell, Statesville; David M. Coltrane, Pleasant Garden; Susie J. Gambill, Sparta; Joseph A. Lail, Shelby; W. Steve Love, Graham; Bobby J. “Bud” Matthews, East Bend; Clark M. Newlin, Haw River; Thomas E. Porter, Jr., Concord; Tony L. Ragan, Sanford; D. Kaleb Rathbone, Waynesville; Lewis E. Smith, Lincolnton; Vickie N. Smitherman, East Bend; Dr. Alton Thompson, Summerfield.